1. 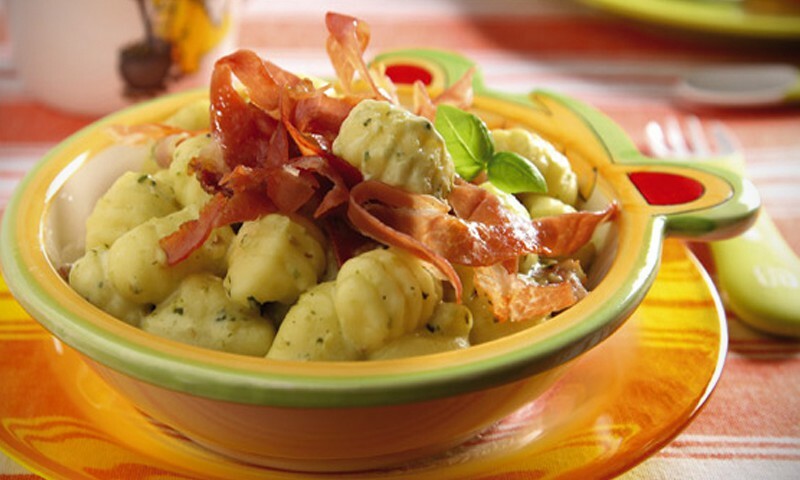 Cut the prosciutto into strips and brown them in a frying pan with butter, add the fresh cream and the pesto, mixing them to create a creamy sauce. 2. Boil the potatoes with the peel on, once cooked, peel and mash them them using a potato masher, add in the flour, egg yolk, Parmesan and nutmeg, add salt and mix to create a soft dough. 3. Spread the dough out into a long rectangle and cut dough into slices, about 4 inches long and roll them into ropes. 5. Using a fork, create ridges in the gnocchi pieces. Boil a pot of salted water. 6. emerge the gnocchi, without overcrowding the pot, when the pieces rise to the surface, remove them. 7. In a pan put the sauce prepared earlier, add the gnocchi, stiring together, place them in a bowl and serve with a sprinkling of Parmasan. The new season of Game of Thrones airs soon, be ready!..